YOUR CAMPING ENJOYMENT CAN HELP A NEEDY STUDENT GET GOOD EDUCATION! 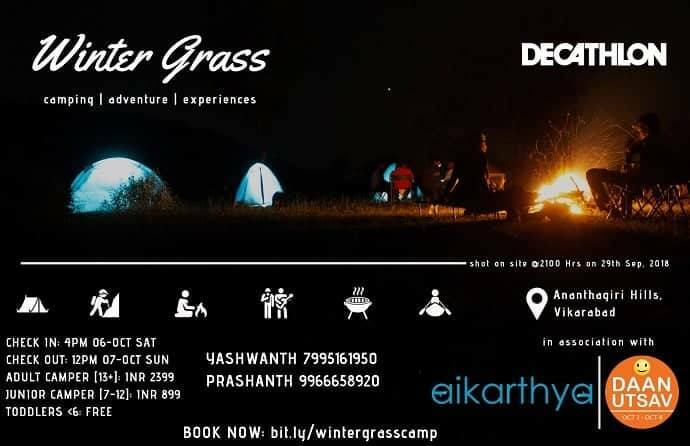 Winter grass and aikarthya presents you an overnight camping experience at Anantagiri hills, Vikarabad.This event is a part of Daan Utsav [earlier called the Joy of Giving Week] which is India’s ‘Festival of Giving’. Let your camping experience contribute to our children’s education as you know aikarthya strives for their development and them to become responsible citizens and change makers.